Nº 1 signifies Jean-Charles’ concept of the penultimate wine that embraces the power of the Napa Valley combined with the elegance associated with Jean-Charles’ native Burgundy. It is the first time, as he hails from Pinot Noir country, that he has delved into a Cabernet Sauvignon that bears his signature style. There can only ever be one Nº 1. 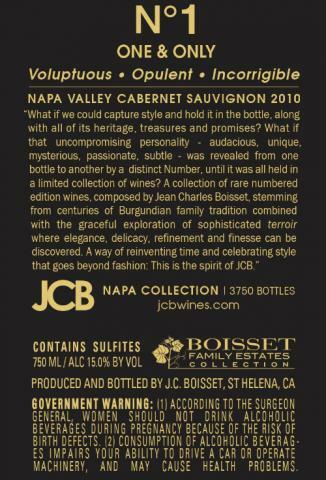 For Jean-Charles Boisset, the Nº 1 cabernet sauvignon must not only age well into the future, it must be VOLUPTUOUS in the present. It must have a commanding structure, yet have flavors that are OPULENT. But above all, Nº 1 must always have a dramatic personality. It is never tamed and predictable. Nº 1 is INCORRIGIBLE. *JCB Nº 1 is not eligible for any discounts or promotions. Vibrant and feminine with lots of floral notes and perfume. The juice spent 26 days on the skin, then cold soaked for just under 4 days. It went through active fermentation, then sat for another 9-12 days on extended maceration prior to draining and pressing.